These crunchy and chewy treats provide a delicious snack that dogs love while providing vitamins and minerals for a shiny coat that dog owners enjoy. 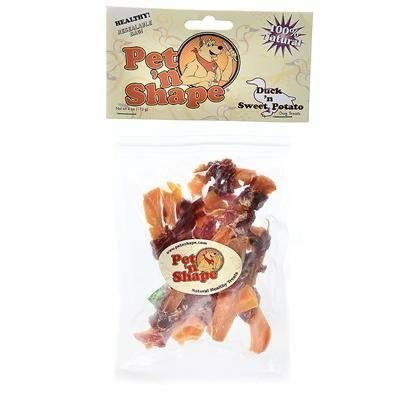 Pet n Shape natural duck treats are made from 100% natural duck fillets. Each highly nutritious treat provides your dog with a high-protein, low-fat, natural and healthy snack. They contain NO additives, NO preservatives, and NO coloring. Each treat is carefully roasted to ensure the ultimate quality and flavor. Great for dogs with sensitive stomachs! They’ll get your Pet n Shape!